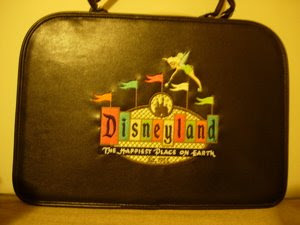 This is a Disneyland 50th Anniversary pin case, which was sold at the park during its 50th anniversary. It features the Disneyland Marquee and one of my favorite gals, Tinkerbell. On the other side of the case is a Disneyland Mouse Ears logo with a 50 in the center. Disney theme parks are always full of pin collectors, and they periodically have to purchase pin cases to store their pins (some of us have to replace them more often than others). This case kind of looks like a purse, since it doesn't have a shoulder strap like other pin cases that I've had, so it's kind of a girly case. Walt Disney Pictures "Return to Oz"
1938 Framed Print of Dopey from "Snow White"